The intriguing title “Abraham Lincoln Vampire Hunter” masks a lackluster and incoherent adventure. “Well duh,” I hear the skeptics say. Young Abraham Lincoln watches his mother die from a vampire bite, and he vows revenge, but not until his pacifist father dies. Also, he witnesses the whipping of a slave boy his own age. Vampires, bad; slavery, bad. Years later Henry (Dominic Cooper), finds Lincoln (now Benjamin Walker) looking for a fight in a bar. Henry takes him under his wing — on the condition that Abe only goes after approved targets. He explains what vampires are and how they work (in this movie), then offers Abe his choice of weapon. 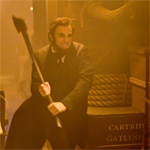 Since he used to split rails, Abe chooses an ax. Abe begins by slaying some of Illinois’ weaker vampires, waiting for the day that Henry assigns him the vampire that bit his mother. Meantime, Abe studies law and works in a store, making friends with his employer Speed (Jimmi Simpson). He also meets Mary Todd (Mary Elizabeth Winstead) and gets introduced to several prominent politicians. Abe woos Mary, goes into practice, and learns that Henry was grooming him to kill the first vampire, “Adam,” for a past grievance, since vampires can’t kill other vampires. There are a couple of action scenes that verge on exciting. The fight that takes place in the middle of a mustang stampede suggests the pounding of adrenaline, and probably played really well in the book. On screen, the nearly exclusive use of CGI makes it hard to feel any real sense of thrill. (Lest you think it’s impossible to film the scene any other way, see Tony Jaa leaping elephants in Ong-Bak 2.) The burning trestle at the end feels about the same — exciting in theory but not quite there on screen. Abraham Lincoln Vampire Hunter also suffers from bland, forgettable characters, with the possible exception of Rufus Sewell as Adam — and even there bad dialogue gets in the way. Mary doesn’t have much to do other than tend to her husband, but at least Winstead shows admirable determination. As Abe, Walker looks like a young Liam Neeson (and in fact played a younger version of Neeson’s character in Kinsey), but lacks intensity. As an orator he borrows the knuckle-pointing mannerisms of Bill Clinton. As Abe’s mentor Henry, Cooper shows more experience, but is too much defined by the sunglasses and curly hair and not enough by charisma and presence. As for the story... I know that it’s called Abraham Lincoln Vampire Hunter, but secretly I was hoping for a smart film that paid homage to its subject, even while tweaking it on the nose. Slavery makes many appearances, always presented in a very modern light. The Civil War shows up in the climax as a surrogate for a personal battle between Abe/Henry and Adam and his henchmen. Not that I feel a lot of sympathy for men who defended slavery, but I can just imagine how insulted dyed-in-the-wool confederacy buffs must feel to have their ideology reduced to vampiric henchmen in a small subplot about a personal story of revenge. I haven’t read Seth Grahame-Smith’s novel, but since he wrote the screenplay I assume he’s the one to blame, along with director Timur Bekmambetov ( Night Watch), for having such a shallow idea of history. It’s as though they memorized the right terms, dates, and facts, then spit them back to their teachers in hopes of a good grade. So you get, for example, Stephen Douglas (Alan Tudyk) dating Mary Todd. You get Jefferson Davis making a contract with the devil. But really you get nothing deeper than the dropping of some names. I just finished reading about physicist Richard Feynman, who told a story from his childhood. Another boy thought Richard was dumb because he could not name the birds on the beach. The Feynmans admitted they didn’t know and didn’t care. They knew more about what the birds were doing — what they were called didn’t matter. Grahame-Smith and Bekmambetov have a names-and-dates grasp of history, but seem to not know (or not care) about the stories and passions that could have been tapped. As I said, I knew I was seeing a movie called Abraham Lincoln Vampire Hunter, so if you want to blame me for missing the point, go ahead. But I was honestly hoping for a clever film that managed not to trivialize the subject too much. Obviously I wasn’t thinking very clearly.